The Interest Rate Reduction Refinance Loan (IRRRL) is helping homeowners take advantage of today’s low mortgage rates. Analysis and live rate quotes. With TRID rules requiring buyers to wait 3 days between receiving a final closing cost statement and going to closing, how to avoid unnecessary delays. With FHA MIP rates down 50 basis points (0.50%) and mortgage rate cheap, the number of homeowners using FHA loans has soared as compared to last year. Should I Lock My Mortgage Rate? A Forecast Of The Week Ahead. Mortgage rates are falling, and have approached their best levels since May. Should you wait for rates to drop more, or is now the time to lock? Analysis of the market and what’s ahead for the week. An interview with the Assistant City Manager of Temecula, California, who talks about what it’s like to live there, and how the city caters to local residents. Treat your mortgage approval like a job, and be good to your team. Tips on playing well with others to get to closing faster. Practical advice you can use. What’s ahead for this week’s market and how will the Federal Reserve affect today’s sub-4% interest rates? 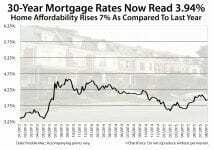 Market analysis, plus complimentary mortgage rate quotes.